Mr. Wagner was born and raised in Pittsburgh, PA and is a graduate of Bethel Park High School. After graduation, he attended Millersville University of Pennsylvania and graduated with a B.S. in Meteorology. Right out of college, Mr. Wagner worked for several years as a Staff Meteorologist and Account Manager for Weather Services Corporation in Lexington, MA. He also holds a Secondary Education Certification from Millersville University of Pennsylvania and is fully licensed to teach Earth Science in Virginia. In 2007, Mr. Wagner earned a Master's in Education Administration from Shenandoah University and is a licensed administrator in Virginia. 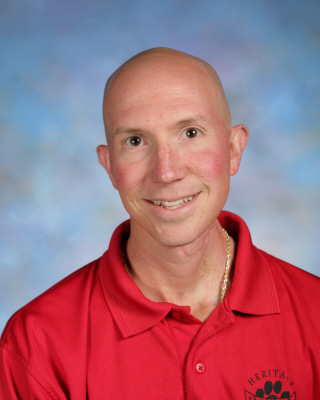 This is his 14th year of teaching, and his third year with a split position between teaching at Hertiage on A days (Earth Science and Geospatial Science), and working as the GIS Lead Teacher to help grow the Geospatial Technology education in Loudoun County Public Schools on B days. Mr. Wagner is also certified as a GIS Professional through Penn State University. Mr. Wagner has high expectations for his students, who are primarily 9th grade Honors students. His goal each year is to not only teach the students Earth Science, but to also get them prepared for what lies ahead in science, in high school, and in life in general. He is passionate about topics in Earth Science and hopes that students will find his class exciting and fun. Mr. Wagner likes to use a lot of technology and provide the students with as many hands-on experiences as possible. Outside of the classroom, he love sports, including baseball, football and golf. He is an advid St. Louis Cardinal, Pittsburgh Steeler and Pittsburgh Penguin fan. Why not the Pittsburgh Pirates? It's a long story...a lot of history involved there. Most important to Mr. Wagner, though is his family. his wife, Megan, is also an employee in the LCPS system. They have a 10-year-old daughter (Hannah) and 6-year-old twin boy and girl (Aiden and Aubrey).